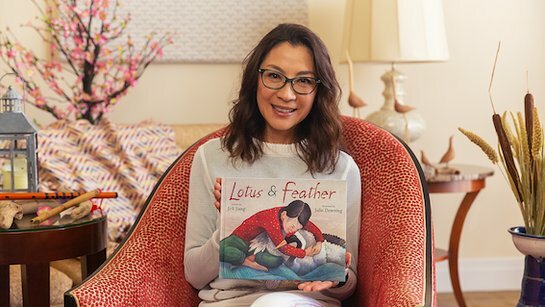 In celebration of the Lunar New Year, the SAG-AFTRA Foundation’s children’s literacy program Storyline Online released its newest video today – Lotus and Feather, a heartwarming children’s book written by Ji-li Jiang, illustrated by Julie Downing, published by Disney-Hyperion and read by award-winning actor Michelle Yeoh (Crazy Rich Asians, Crouching Tiger, Hidden Dragon). An emotionally stirring and uplifting read-aloud, Lotus and Feather is the story of a young Chinese girl named Lotus who has lost her voice due to illness. She rescues a wounded crane that she names Feather, and nurses it back to life. The two develop a close friendship that is tested when it is time for Lotus to release Feather back into the wild. Based on a true story, Lotus and Feather offers children lessons of friendship, love, and letting go. “We are very excited to add Lotus and Feather to the Storyline Online library. Michelle’s storytelling could not be more exquisite, both gentle and powerful. She brings these characters to life in a way that leaps off the page. We think our young audience is going to be very taken with this new story,” says Cyd Wilson, Executive Director of the SAG-AFTRA Foundation. An Emmy-nominated program of the non-profit SAG-AFTRA Foundation, Storyline Online streams 55 videos at no cost to children, parents, and educators worldwide, and receives over 10 million views every month. In addition, Storyline Online is endorsed by the American Federation of Teachers, which represents 1.7 million teachers and education professionals. As with all Storyline Online videos, Lotus and Feather comes with a complimentary supplemental activity guide aligned with Common Core Standards that strengthens verbal, written and comprehension skills. Aimed at 2nd-3rd grade students, these activities encourage children to engage in critical thinking activities and ponder the themes of the book including care-giving, Chinese culture, the environment and endangered species. To watch Lotus and Feather and all of Storyline Online videos, visit storylineonline.net, and subscribe to youtube.com/storylineonline.